As most of you probably know by now, here at Master Mechanic High Park, we’re quite fond of our resident fur baby, Charlie! While he is likely 8 or 9 years old, this past Tuesday, February 27th, marked the 4th anniversary of a very special day in our lives. It was the day our co-owner, Josie Candito, rescued Charlie–or he rescued her if she’s the one telling the story. For those of you that don’t know, Charlie is Josie’s rescue dog and best friend. At a particularly trying time in her life, Josie discovered Charlie abandoned on the side of the road. It was an early winter morning in Etobicoke, and he had clearly been neglected for a while. She immediately got him the necessary medical attention, and when no one came forward to claim him, she took him into her home. To say both of their lives changed forever would be an understatement! Since then, he’s been by her side day-and-night and has become a very familiar face at the shop. In fact, he IS the face of the shop! You may have seen him on the Master Mechanic sign out-front, or inside the shop where he waits to welcome customers getting their vehicle serviced by his ‘Uncles’. This week, the Master Mechanic High Park sign, which typically features positive messages for the community, also paid tribute to Charlie. It read: “Charlie, thank you for rescuing me 4 years ago. U inspire me to be the best version of me!”. It’s clear to see just how much he means to Josie, and anyone who has met the pair can attest to that. 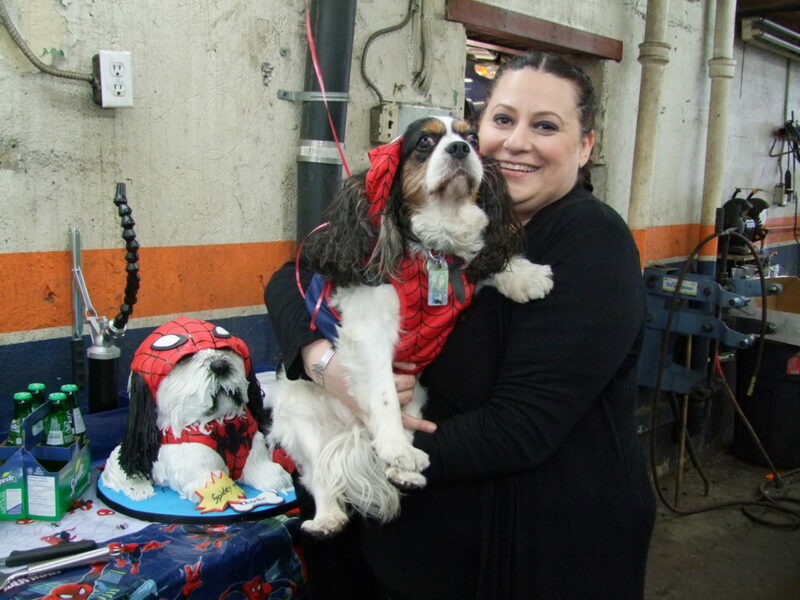 To mark their 4-year anniversary, Josie hosted a party at Master Mechanic High Park for her pup, close friends and customers. 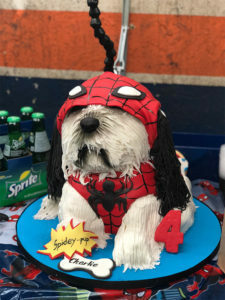 It was essentially every kid’s dream: a Spider-Man-themed party complete with balloons, decorations, pizza, and even a Spidey-pup outfit for the dog-of-the-hour. A cake made in Charlie’s likeness (from the very talented Artsy Baker) was the highlight of the day and was as beautiful as it was delicious. The weather was surprisingly warm for February, as everyone came together to celebrate, enjoy food, and share their favourite stories about Charlie. 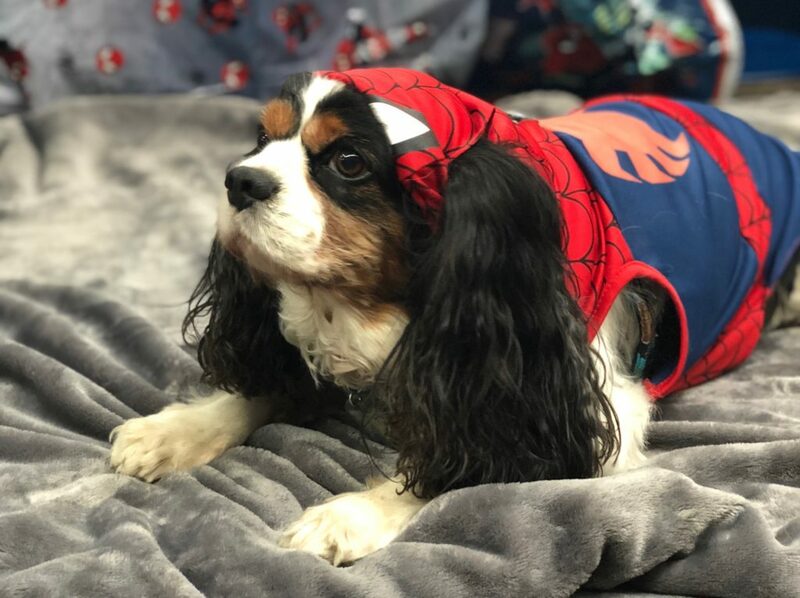 With SNAPD photographer, Shane Jeffery, in attendance, Spidey-Pup was as happy as ever to strike a pose in his outfit. After the party, Charlie left full of love and delicious food to enjoy a nice walk. He took the rest of the day off as a well-deserved treat…and took some actual treats home, as well! Big thanks to everyone that came by and reached out with well-wishes to make this special day all the more memorable! Charlie brightens our lives daily, and we hope he felt a bit of that love in return. To say hi to Charlie, stop by the shop! Feel free to bring a furry friend of your own–Charlie loves making new friends, and Josie always has treats waiting!